For a more detailed look into the operative steps of this surgery please visit this article where Drs. Pelletier and Jacobs have given a series of drawings illustrating the technique for these Fontan and Glenn Stage II operations for patients with a single ventricle. The bidirectional Glenn procedure is the surgery used to prepare the heart for a Fontan procedure. 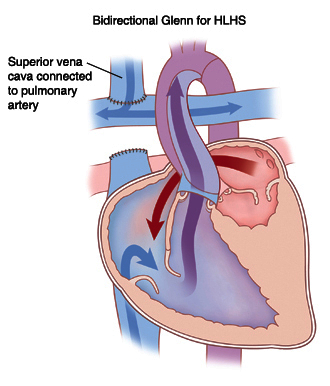 It is a surgery in which a detour (shunt) is created from the aorta to the pulmonary artery. The surgery is performed on infants and young children who are born with a congenital heart defect that reduces the amount of oxygen-rich blood circulating throughout the body. These infants often show signs such as a bluish tint (cyanosis) to the skin, lips, fingernails and other parts of the body. Although a successful procedure will improve immediate signs and symptoms of the underlying heart defect, the procedure does not correct the heart defect. Other surgeries are usually necessary in the future to repair the defect itself. The surgery involves an incision in the chest, but it is not an open-heart surgery. Parents can expect their infant to remain in the hospital for about three to six days after the surgery. Parents are also encouraged to discuss with a pediatric cardiologist and heart surgeon all benefits and risks associated with this procedure. In most cases, the benefits greatly outweigh the risks. What is the Fontan modification called the Bidirectional Glenn shunt ? Although not exactly a Fontan operation, a bidirectional Glenn (BDG) shunt is similar to it - and is called a type of "Partial Fontan" operation. It is also called Bidirectional Cavo-Pulmonary Shunt (BCPS). At a second operation, the lower body venous blood will also be diverted to the lungs, thus creating the "complete" Fontan circulation. The bidirectional Glenn shunt is preferred in very small babies - below 2 years of age - in whom the lung vessel resistance is still quite high, and in borderline cases with abnormal pulmonary arteries. While avoiding the risk of failure of a complete Fontan operation, it also partly relieves symptoms. If all is well after the Glenn shunt, and the lung vessel resistance is low, a change to complete Fontan is possible. Otherwise, nothing further is done. How is a BDG helpful ? It decreases volume load on the single ventricle while improving oxygen saturation as compared to the pre-operative state. In addition, by being a low-pressure shunt, it does not carry the risk of causing lung blood vessel thickening and hardening. Bi-Direction Glenn Shunt Surgery Cardiac Surgery Videos: Bidirectional Glenn Procedure. These pages contain video links to clear images of actual procedures and surgeries made available solely for educational purposes. Their contents may be upsetting to some viewers and discretion should be used.